Southern Utah is full of mesmerizing landscapes and unique ways of exploring them. Visitors can hike, bike, ride ATVs, and embark on so many different types of excursions through the various trails and national parks in the area. You don’t have to search very long to find some of the best Brian Head summer activities during your visit! This ski resort turns into a summer paradise when warm weather rolls around! 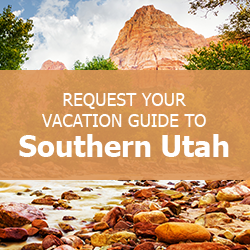 If you want to find more great summer activities in and around Brian Head, you should request our complimentary Southern Utah Vacation Guide! Have you ever wondered what it would be like to scale the gorgeous red rocks of Southern Utah? The Cliff Hanger Climbing Wall allows you to experience a similar feat. This exciting Brian Head summer activity is a great way to test your strength, will, and endurance. The 24-foot walls feature safety harnesses and an auto-belay system so you can feel safe and secure as you partake in this fun and challenging adventure. You can make the run twice for just $10! You can take the Giant Steps Express up to the Family Adventure Trail, where you can hike a through the beautiful Southern Utah backcountry on the Vista Hiking Trail. Guests can pan for gold, dig for fossils, hunt for treasure, and much more in the resort area. This is one of the best Brian Head summer activities if you want to enjoy a relaxing afternoon during your Southern Utah adventure. The Scenic Lift Ride is open from Friday to Sunday each week during the summer. Sit back and enjoy the stunning views of Brian Head on this leisurely trip up and down the mountain! There are a variety of exciting mountain bike park trails that you can tear up when the weather gets warmer. Take the Giant Steps Express to the top of the mountain where you can revel in the four diverse trail options for all experience levels. You can also use the Brian Head Shuttle service that can transport you to Bunker Creek Trail, Blowhard Mountain Trail, and Dark Hollow Trail. From there, you are free to explore Dixie National Forest, Cedar Breaks National Monument, and other breathtaking areas of Southern Utah! You’re sure to enjoy this excellent Brian Head summer activity. For a full list of Brian Head summer activities and pricing, check out the Resort website! Your Southern Utah retreat isn’t complete without a stay in a spacious and comfortable Family Time Vacation Rentals property! Our condos and homes feature locations in Brian Head, Duck Creek Village, and several other places in the area that give you easy access to some of the best attractions in the southern region of the Beehive State. Whether you want to explore the canyons of Zion National Park or take in the views from a scenic vista at Cedar Breaks National Monument, you’ll experience something you never knew existed in the beautiful land that is Southern Utah. Start planning your trip by booking one of our rental properties today! We love our unique state, and we think you’ll love it too!